Born in Bishop, CA, a native of El Dorado, CA, and a 2003 graduate of Union Mine High School, Staff Sergeant Sky Mote joined the Marine Corps in July 2003. SSgt. Mote began his career as a Flight Navigator, became a Bulk Fuel Specialist, and then lateral moved to become an Explosive Ordinance Disposal Technician in 2007. 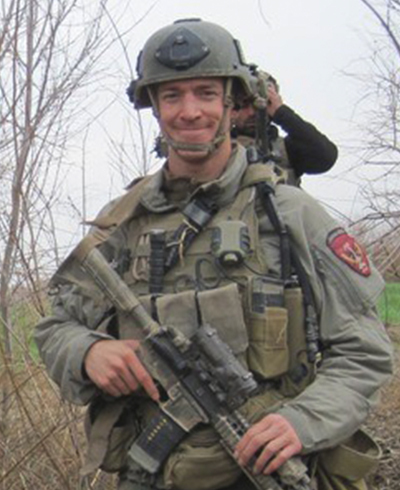 He joined MARSOC in August 2009. SSgt. Mote loved the outdoors and enjoyed camping, hiking and riding horses. SSgt. Mote deployed in support of both Operations Iraqi Freedom and Enduring Freedom. In the early morning hours of Aug. 10 at the Village Stability Platform in Puzeh, following a meeting with local Afghan officials, a rogue local Afghan dressed in a police uniform opened fire on the team’s leadership killing SSgt. Mote, his Team Leader, and his Team Chief. SSgt. Mote’s personal decorations include the Navy Cross awarded posthumously in January of 2014, a Purple Heart, a Navy-Marine Corps Commendation Medal, Navy-Marine Corps Achievement Medal, two Combat Action Ribbons and three Good Conduct Medals.